Dr. Gawande is Executive Director of Ariadne Labs and Professor in the Department of Health Policy and Management at the Harvard T.H. Chan School of Public Health and Samuel O. Thier Professor of Surgery at Harvard Medical School. He also is the founder of Lifebox, a global nonprofit organization devoted to eradicating some of the world’s deadliest surgical conditions. “Anesthesiologists thinking systematically about what we can do in surgery is incredibly inspiring to me. You took your field from having deaths that could occur on a regular basis to perfectly healthy people,” Dr. Gawande said. The challenge is to get more people around the world to buy into the concept of teamwork because medical professionals are not trained to work as a team. The World Health Organization’s Safe Surgery Saves Lives Program was launched to develop checklists and expand their adoption. A related study at eight cities around the world demonstrated how effective teamwork is. “What we found was that complications fell by half in every hospital that had adopted the program. The reduction in deaths was 47 percent. It was extraordinary. It was a sign that thinking about ourselves as a system would be transformative,” he said. Further studies in South Carolina are showing similar advances in outcomes, but the success of adopting checklists varies according to their implementation. Canada simply mandated implementation, which did not improve outcomes. “Other countries rolled the checklists out as a leadership commitment, not a mandate, and had regular feedback, treating it as a culture change,” Dr. Gawande said. As a result surgical deaths fell 43 percent in Norway, 35 percent in France and 26 percent in Scotland. A new development is a manual of checklists for crisis events. The checklists have been designed to be easy to read. An Emergency Manuals Implementation Collaborative and other studies, including one at Stanford University, are looking for even better methods of implementation. 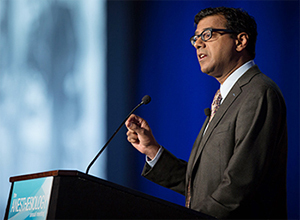 However, improved surgical outcomes depend on more than just teamwork and systems, Dr. Gawande said. He explored the importance of determining which outcomes matter the most. Talking with the patient and families about treatment options is vital, and he used a case to illustrate the point. An elderly woman with dementia was severely burned while smoking in bed. After talking to her family, health care professionals treated her burns and she was on the road to recovery at three weeks. When her family realized she would need a tracheostomy and a feeding tube for the remainder of her life, they rejected that treatment. The patient died 24 hours after extubation, he said. A study of stage IV lung cancer patients randomized the terminally ill patients to usual oncology care or palliative care. Study results showed that the number of patients in the early palliative care group who were still receiving chemotherapy two months before death was half of those receiving usual care, Dr. Gawande said. “Overall measures of suffering, anxiety and depression were down in the group that got early palliative care,” he said. “They spent less time in the hospital and in the ICU, with 30 percent lower overall costs. They started hospice sooner and had more time at home. The lesson, he said, is to talk to patients and families about how they want to live versus just working to prolong their lives.